Soon after the SN 1987A outburst, three major groups embarked in a photometric monitoring of the supernova: SAAO, CTIO, and ESO. In particular, the ESO team reported an infrared excess which became apparent beginning less than one month after the explosion (March 11, 1987). Three possible interpretations for it were discussed in this work: the infrared echo hypothesis was discarded, and thermal emission from dust that could have condensed in the ejecta was favoured (in which case the estimated temperature at that epoch was ~ 1250 K, and the dust mass was approximately 6993659999999999999♠6.6×10−7 M☉). The possibility that the IR excess could be produced by optically thick free-free emission seemed unlikely because the luminosity in UV photons needed to keep the envelope ionized was much larger than what was available, but it was not ruled out in view of the eventuality of electron scattering, which had not been considered. ^ "Hubble Revisits an Old Friend". Picture of the Week. European Space Agency/Hubble. October 17, 2011. Archived from the original on October 19, 2011. Retrieved October 17, 2011. ^ Sonneborn, G. (1987). "The Progenitor of SN1987A". In Kafatos, M.; Michalitsianos, A. (eds.). Supernova 1987a in the Large Magellanic Cloud. Cambridge University Press. ISBN 978-0-521-35575-9. ^ Nomoto, K.; Shigeyama, T. "Supernova 1987A: Constraints on the Theoretical Model". In Kafatos, M.; Michalitsianos, A. (eds.). 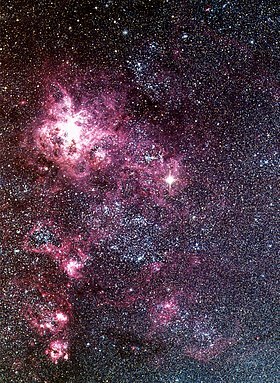 Supernova 1987a in the Large Magellanic Cloud. Cambridge University Press. § 3.2. ISBN 978-0-521-35575-9. ^ Lucy, L.; et al. (1991). Woosley, S.E. (ed.). Dust Condensation in the Ejecta of Supernova 1987A - Part Two. Supernovae. The Tenth Santa Cruz Workshop in Astronomy and Astrophysics, Held July 9–21, 1989, Lick Observatory. New York: Springer Verlag. p. 82. Bibcode:1991supe.conf...82L. ISBN 978-0387970714. Wikimedia Commons has media related to SN 1987A.